Jet Set Vanity 341630 from Nexera may be used closed and open. When closed, it acts as a writing desk and convenient casual work space in the bedroom. When open, you will find a mirror and enclosed storage space large enough for beauty accessories, bottles, and more. Jet Set Collection from Nexera is a contemporary bedroom collection offered in a rich Ebony finish with a choice of 3 platform bed sizes - twin, full and queen. Create a glamorous space to doll yourself up with this chic mirrored vanity. The mirror finish paired with brushed silver trim will add sparkle and sophistication to any dicor. The two storage drawers provide the perfect place for storing makeup, hair accessories, scarves or jewellery. Beautifully detailed, this piece is a must have for your bedroom. 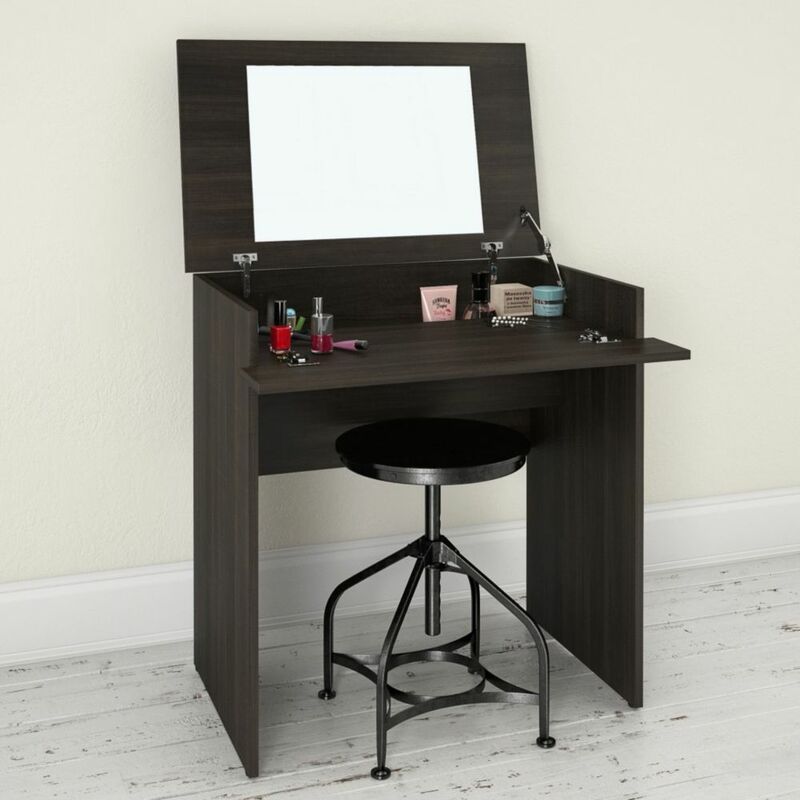 Jet Set Vanity in Ebony Jet Set Vanity 341630 from Nexera may be used closed and open. When closed, it acts as a writing desk and convenient casual work space in the bedroom. When open, you will find a mirror and enclosed storage space large enough for beauty accessories, bottles, and more. Jet Set Collection from Nexera is a contemporary bedroom collection offered in a rich Ebony finish with a choice of 3 platform bed sizes - twin, full and queen. Jet Set Vanity in Ebony is rated 5.0 out of 5 by 1. Rated 5 out of 5 by Nitty from Excellent! Got this as a gift for my birthday. It arrived within a few days. Fairly easy to put together. Exactly as described. I didn’t realize it in the picture but there is a deeper part in the back to keep your taller products. The only issue we had was the screw holes on the one side of the mirror were off, so we weren’t able to close it. Husband emailed them and they sent me another mirror promptly. Other than that, everything is great and definitely worth the price!